Locket has been loving created using the finest schulte mohair in sunshine golds. She has tiny glass eyes, a hand embroidered nose and tickly toe detailing has been added to her tiny paws. A simple colour coordinated organza floppy bow and shoestring necklace have been added to finish her look. Charlie always wants to create a traditional range of teddy bears each year within the minimo series as she wants to ensure we have a bear for every collector, this popular mini series was first seen in 2018 and is named ‘The best things come in small packages’. The 3 new characters added sit beautifully in your hug alongside, Raindrop, Peashoot and Rosebud. 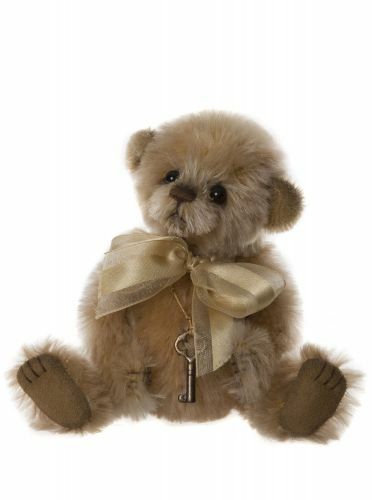 So like Charlie if you adore these tiny kitten weighted bears look out for YoYo and Pocket too! Locket is an adults collector bear so recommended for collectors aged 14 years and above and is a numbered limited edition piece to only 600 worldwide.